The medical field is one of the few areas where jobs are being created. 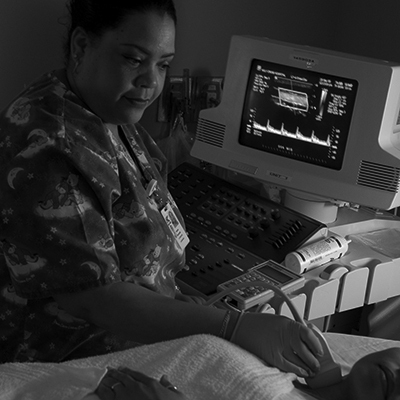 An area that has been growing and will continue to grow for the next 10-20 years is in the field of medical sonography. More popularly, sonography often is known and referred to as ultrasound technology. In order to become an ultrasound technologist, training is necessary, but certification is not. Becoming a certified ultrasound technician, however, opens job opportunities as it sets an individual apart from those who have not proven themselves professionally. That is why finding certified ultrasound technician training is a smart career move. First, it might be good to mention what an ultrasound tech actually does in their day to day jobs. A typical day for an technician involves using ultrasound equipment to capture images of what is happening inside a person’s body. This includes expectant mothers, as well as people with sports injuries or perhaps those who need diagnostic procedures completed on them. I myself have been a patient of an ultrasound technician as I had a condition known as severe varicose veins. The technician (who was indeed certified) used a wand to view the blood flow inside my legs and determined that I had improper valve operation. I was fascinated with the procedure as it was non-invasive and I could actually see the blood flowing (or not flowing in my case) on the screen. The science behind the technology involves ultrasound equipment which uses high frequency sound waves to show the internal workings of a body. Of course we all know that the most well known use of ultrasound equipment is to view a fetus inside a woman’s body to determine whether the child is healthy and developing at a normal rate. In my case it was to view blood flow through out my veins in both of my legs. I should mention that after the technician did my procedure, then my doctor actually made the diagnosis after studying the images. In any case, if you want to enter into this career, a great first step is to complete two years of full time study after graduating from high school. This typically involves obtaining an associates degree at an accredited college. After you get your degree, you can then focus on your next goal….to achieve basic certification in ultrasound. There are a few programs in the United States that will allow you to obtain a 4 year degree if so desired. Those schools and programs will be discussed in other articles on this site. If you desire to enter the field of medical sonography it helps to have a natural curiosity about technology, excellent people skills and the ability to work as a team. The position requires working with patients and their families, as well as nurses and doctors. If you are a “loner” type and don’t want to interact all day with people…this is NOT the career choice for you. So, just what is involved in becoming a certified ultrasound technician? Typically most school programs offer the student rigorous training in anatomy, patient care, and medical ethics as well as learning how to use different types of sonography equipment. They may also be trained to perform gynecological and obstetric ultrasounds, abdominal and neural ultrasounds accurately and efficiently. When choosing a school, finding one that offers clinical training as well as classroom learning will help fulfill the need for practical experience. If this is not offered, gaining the experience necessary may be difficult as it is hard to find a position without having worked in the field. There are several professional sonography organizations that offer examinations. Those organizations are highlighted throughout our site. Passing these exams leads to certification in different types of sonography and demonstrates a certain level of proficiency. Before you may take one of these exams, a person must first receive training in a formal program following high school. In addition, a year’s worth of practical experience in the field is usually required before the exam can be taken.